In Tetris, there are several types of tetrominoes, each having a letter that it resembles. The four buttons on the left represent four of these shapes. 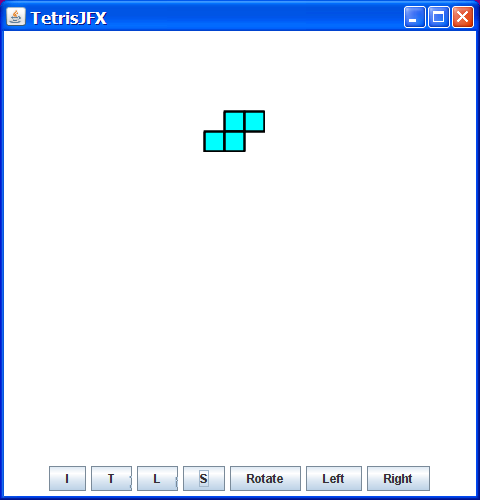 When you press one of these buttons, the corresponding tetromino appears at the top and begins moving down the screen. When you click the Rotate button, the tetromino rotates to the right, and the Left/Right buttons move the tetromino left and right, respectively. As explained in the Spinning Wheel post, the Key Frame animation syntax that you see here will become much less verbose as the JavaFX Script compiler team continues to address animation. JavaFX Script programs should always be designed with the UI binding to a model. In this program, the model is represented in one class named TetrisModel, located in the FX file of the same name. You may find it helpful to take a look the Creating a Compiled JavaFX Script Program with Multiple FX Source Files post to see a Hello World style program that has more than one FX file. Please notice the package statments in this Tetris program, as that influences where you need to put the source files and how you build them. You can obtain the JavaFX Compiler by following the instructions in the Obtaining the OpenJFX Script Compiler post. *  to serve as a compiled JavaFX Script example. Compile and execute this example, and examine the code. I'll get busy making it behave a little more like a Tetris game, and show you some progress in the next post. Please feel free to get ahead of me, and make your own version! JavaFX Script Boot Camp Registration Now Open! 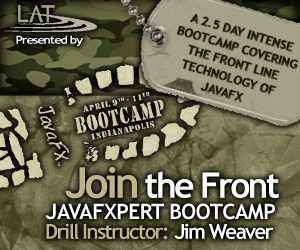 I will be offering a 2.5 day JavaFX Script day "boot camp" on Wednesday, April 9 through Friday, April 11, 2008 (ending at noon) in Indianapolis, Indiana. By the way, I'm scouting out the next location, so if you have suggestions for where I should offer a future BootCamp please let me know! When you click the Rotate button, the tetromino rotates to the right, and the Left/Right buttons move the tetromino left and right, respectively. answer button to see the answer.